In this combo we’ve selected three of the preferred activities for adventurers and lovers of nature and extreme excitement. 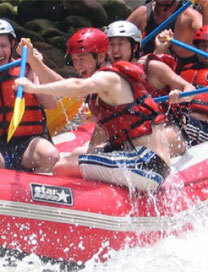 All the activities are based at the Adventure Center, located about 35 minutes from La Fortuna. 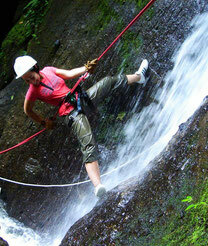 The first excursion you’ll enjoy is rappelling. Waterfalls of crystal clear waters, a spectacular canyon in the middle of a magical forest with sounds that you can only enjoy in the depths of the mountain. After receiving training from specialized guides, we’ll enter the cloud forest to experience six exciting descents, each one a different surprise. Three of the rappels are with waterfalls. This day of adventure continues while you enjoy the rapids of the Balsa River in a section of class II & III rapids; the perfect combination of nature and adventure. Halfway through the tour you’ll stop along the river to enjoy some seasonal tropical fruits and take a dip in the river. A delicious and hot lunch awaits you at the end of the tour. 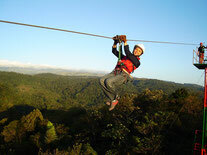 Enjoy the forest from a viewpoint you rarely get to see; take on the adventure of flying like Superman on a 750 meter (about 2,300 ft.) cable on this third and last part of your adventure. 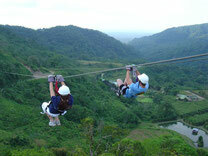 Additionally there are 8 other ziplines, the exciting Tarzan Swing, and a hanging bridge. Bring aquatic shoes and extra clothing to change into.